Marietta Silos has pioneered cutting-edge materials and practices for over a century and leads the nation in concrete silo construction. Third-party silo inspections, maintenance and repair services are the most effective method to ensure the integrity of concrete structures, surfaces, and silos. Marietta Silos provides numerous repair and maintenance services for all minor and emergency concrete silos issues. Coal powered generation facilities have to plan for disposal or reuse of byproducts created from the coal burning process. While often less expensive upfront, steel silos have inherent limitations and pose a number of safety risks. Marietta Silos leads the way in silo engineering, design, construction, inspection, cleaning and repair. We are the only contractor in the U.S. that can take care of every aspect of your silo, leveraging our century of knowledge as industry experts. We have pioneered cutting-edge systems and practices in concrete silo construction and are the only company involved in Jumpform, Slipform and concrete stave and silo construction, inspection, cleaning, repair and other services for industries such as manufacturing, mining, chemical and power. To help ensure the integrity of concrete and steel structures, surfaces and silos, we have an integrated silo inspection and cleaning program and repair consulting service, helping keep concrete structures performing at their best. Stop by the Marietta Group exhibit in booth #44 to chat about silo construction, inspection, cleaning, maintenance and more! There are currently no webinars scheduled. Please call us to schedule your webinar. 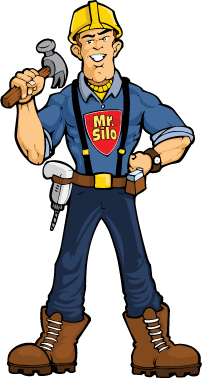 Mr. Silo is an industrial concrete expert and the go-to for all your concrete construction, inspection, or repair questions.